When I found out I was having twins one of the first things that came to mind was my paternal aunt. She was the mother of fraternal twins. Then I realized my husband’s sister also gave birth to fraternal twins. I couldn’t help but wonder if having twins on both sides of the family somehow affected our chances of conceiving twins – but what I found out was not what I expected to learn. That split from one living being into two appears to be a feat of nature with very little explanation. Women of all races and ages conceive identical twins at the same rate. Though female identical twins are more likely to conceive twins, it does not mean those twins will be identical. Having fraternal twins is a genetic trait passed from mother to daughter. If there are fraternal twins on the husband’s side of the family it has nothing to do with his partner conceiving twins. My aunt didn’t impact my chances of having twins either. She was my father’s sister, so he could not pass the trait to me. Where Does the Trait Come From? My mother passed the genetic trait to me that increased my chance of having twins. There were no twins on her side of the family, that we could find, but the trait was there none-the-less. There is also the chance that genetics played no part in my twin conception. Sometimes the human body just releases two eggs at one time and the sperm are there to fertilize the eggs within a short time resulting in fraternal twins. So, the answer to the question is simple. If you are pregnant or gave birth to identical twins – those twins are not the result of some twin gene passed from one generation to another. 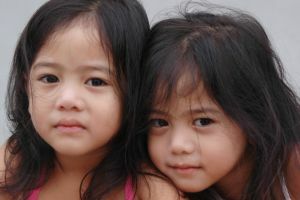 Fraternal twins, however, can be the result of genetics and twins do not skip a generation, so your daughters are more likely to conceive fraternal twins too.